This post was produced in collaboration with 80,000 Hours. The introduction, below is also available on 80,000 Hour’s website. The detailed methodological considerations supporting it are below. These considerations can be easily extended to a wide range of similar applications, including the rate at which foundations spend down their reserves. If you’re committed to making the biggest difference possible with your career, you may well find that there is a tension between doing good now and laying the groundwork for doing good later. Next year, you have two choices. You could work for an effective charity, making an immediate difference to its beneficiaries. Or you could go to graduate school and build up your career capital, (hopefully) allowing you to have a larger impact later. You have a substantial sum of money. You could give it today, or you could invest it, allow it to grow, and then give the larger amount later. How can you go about deciding between these options? There are a number of factors which can affect whether it would be more effective to do good now or to wait until later. Here we’ll go through some of the most important ones. The main argument for doing good now is that the best opportunities are getting snapped up, so that the longer you wait, the harder it will be to have the same impact with your work or your donation. Opportunities for bigger and easier interventions are likely to be taken sooner, before it’s considered worthwhile to look into smaller and more difficult areas. On the other hand, research continually improves our understanding of which interventions are likely to be effective. As a result, the opportunities for doing good may actually increase over time: just because an intervention is big and easy, doesn’t mean anyone even knew it was possible 20 years ago! Another critical factor to consider is the extent to which investing your time or your money will give increased returns in the future. Invested money will increase at a pretty standard rate throughout your life. By contrast, the rewards for investing in yourself are likely to be much higher if you prioritise this early in your career: many people dramatically increase their ability to earn and change the world in their first five to fifteen years of work by learning skills, gaining promotions, studying further and building networks. How certain are you are in your views about which causes are the best? If your views are unstable, this tends to point towards waiting until you are more certain. Otherwise, you could give up opportunities for investment, only to find out that the cause you’ve been supporting isn’t that effective after all! The exception to this is if giving will allow you to learn more. This might involve working in or funding causes you think are contenders to be the best, or funding comparisons between them. This option is particularly good if you can get information that will help not just you but other people in similar situations. In this case we think that the best option is likely to be to give now to improve your knowledge about which causes are best. Just as opportunities to do good diminish in general (as set out earlier), they will also diminish within a particular cause. The result is that the more attention a cause has already received (in terms of research, man hours, donations etc), the less effective additional resources will be. Therefore in areas where little has been done, and which therefore have the potential for fast growth, helping now may be particularly valuable: if you wait, the best work may already have been done. By contrast, in areas which are well-established, the difference between helping now and helping later is likely to be less pronounced. One area where this recommendation is ambiguous is in cost-effectiveness focused global poverty interventions. Development aid as a whole is a large area which is not quickly growing, but it may be that the proportion of spending which is directed towards the most cost-effective interventions is increasing quickly. It’s unclear which is the more appropriate reference class, and we are not confident whether it’s better to give now or later in this case. As you can see, the decision whether to do good now or later depends on the circumstances listed above, and will vary case to case. However, the earlier you are in your career, the less stable your view of the best cause and the more well-established the cause, the more the balance shifts from doing good now towards doing good later. The factors considered above are the main ones, but they are not exhaustive. Below are a a couple of other points worth considering. Even if you are focusing on giving later, it may well be best to do something now in order to avoid burning out or getting out of the habit of doing good. Doing good can make you happier, help you to stay motivated, and bring others on board by demonstrating your commitment. It is normally advisable to stay involved in making a difference in at least some capacity, perhaps by donating 10% of your income, befriending other altruistic people, and making a public declaration of your intention to lead a high-impact career. In a similar way if you are giving now it may still be worth holding on to some investment as personal reserves. You can only claim tax relief against this year’s income, which means you’ll get more tax relief if you give now. However, you can get around this issue by putting your funds into a Donor Advised Fund. There could also be other tax considerations that push one way or the other. The conclusions discussed in the summary were driven by a combination of a model which helps to decompose the question into easier-to-consider components, and common sense. We have the highest confidence in our views in the cases where all the factors point in the same direction. In section 2 we explain our model: section 2.1 assumes that we’re trying to maximise long-term wealth, and section 2.2 relaxes this assumption. In this section we will assume that value is tracked by the economic benefit provided, which simplifies the analysis. How well economic growth tracks what we ultimately value is a controversial question, which we’ll not try to answer here. We think increasing wealth is important, though there are other factors that matter, so we’ll consider a broader model in the next section. We will note that it’s a common position that, for the majority of the world’s inhabitants, increasing their wealth would tend to increase their well-being. It also gives us something concrete to discuss. In the next section, we’ll relax this assumption and consider models for the general case where value may be very separate from growth: we think that qualitatively similar conclusions hold in either case. Let’s consider a unit of resources (either labour or money) being spent on an intervention that makes the world a better place, for example spent on distributing malaria nets in Africa. Initially, it prevents some people getting malaria – making their lives better. It also makes these people more generally productive, enabling them to better help their families, friends and the people they trade with, who then help their connections and surrounding society, who then help the people they’re connected with, and so on. At first there’s a relatively narrow impact (fewer people with malaria), but over time, the benefits get gradually spread out. Once the benefits have spread out enough, we can think of them as contributing to the general stock of ‘assets’ in the country (human capital, physical capital, institutions, and so on), which then generate further value each year at the country’s growth-rate. Once the benefits spread out even further, we can think of them as contributing to one big pool of world assets, growing at the world growth-rate. We can see that the growth of the benefits produced by the intervention must eventually correspond to the world growth-rate, otherwise they’ll occupy a larger and larger share of the world’s assets see more detail here. In the gap of one year, you invest your resources, earning a return, r. But you lose one year of growth, g, from the start of the tail. What’s r – g over the next year at the margin? How does m2 compare to m1 at the margin? Let M denote the value of m for the best intervention you know of at a given time. M can change over time as new interventions are discovered and the existing ones are used up. Let’s call the growth rate of M, f.
Then, it’s better to give later if: r + f – g > 0. Note: For technical reasons, the values in the inequality must be instantaneous growth rates. These can be computed from average growth rates over a period. 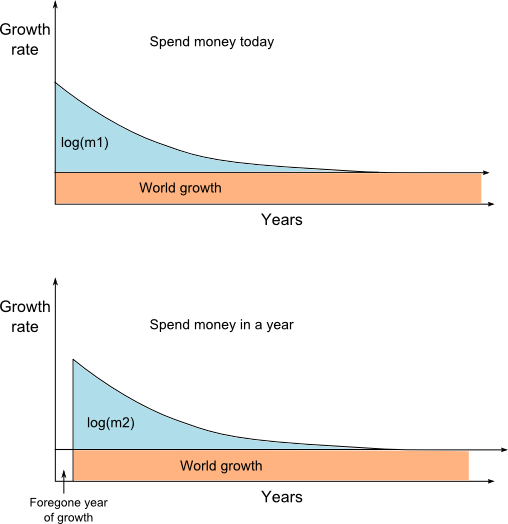 Where the growth over the period is small it is close to the instantaneous rate – if world growth is 2% over a year it implies that g = log(1.02) which is 1.98%. What is r minus g? We think r is usually higher than g, which is a pressure that favours giving later unless our opportunities are drying up more quickly than the gap. Rates of return on investing in your own human capital can be much higher. For instance, the returns on doing an undergraduate degree due to higher income are likely 10-15%, and it seems likely these expected financial returns reflect a more general increase in your career capital (though there’s a debate about whether this consists of signalling, skill development, or networking). There seems to be other investments in your human capital that abound early career, which also have returns well above 3%, such as graduate study, learning valuable skills (such as computer programming), and building a network, though our confidence is less since we haven’t seen detailed quantitative estimates. Moreover, we take it to be a common sense position that young people should focus on building their career capital, and will generally be at the peak of their influence later on. However, your opportunities to invest in your human capital decline over time. This is because you’ll use up the best investment opportunities: you can only learn to read once – a very useful investment in your career capital! It’s also because investments made later in your career yield lower returns, because you’ll have less time to reap the benefits, e.g. if you learn to program at age 64, you’ll only have one year in which you can use the new skill. How is M changing over time? The quantity f represents the growth rate of M. If f is positive it means that the best opportunity we know of this year is better than the best opportunity we knew of last year. When f is negative, the best opportunity is worse now than the best opportunity was before. 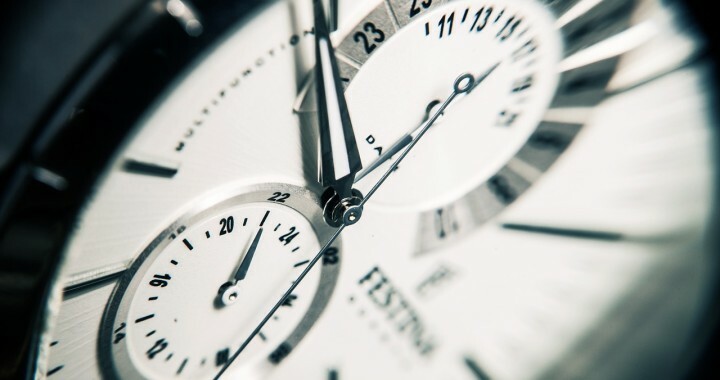 The larger f is, the more important timing your activity is. We think f may be positive over the next few years for large and established cause areas, and negative for small growing cause areas. More unequal societies and more complex societies may afford opportunities with higher values of m. Both of these properties allow greater leverage to be brought to bear. On the other hand in a perfectly equal and simple society one cannot do anything of larger impact, and the m will be close to 1 for all reasonable interventions. It’s unclear if inequality is increasing or decreasing. Within countries it seems to be increasing at the moment, but between countries it seems to be decreasing. Increasing levels of technology and inter-connectedness are probably increasing the complexity, allowing higher-leverage opportunities. This consideration suggests higher f, but it is hard to quantify the effect and it may not be large. Societies with more resources devoted towards helping others (through e.g. philanthropy, welfare, government aid, public-good research), and with these resources more smartly directed, will be better at taking the opportunities with the highest m, leaving worse opportunities available as diminishing returns mean the best are used up.  The rise of the effective altruism and evidence-based policy movements is likely to mean increasing resources devoted to the best opportunities. This consideration supports a lower f.
As a first approximation we may think that returns to resources in a cause are logarithmic, so increasing resources being devoted to the area reduce the size of f by the rate of growth of those resources. You may get better at identifying good opportunities, so M may be higher for the same distribution of m. This may be driven in part by increasing personal wisdom, as you learn more about yourself and the world. It could also be driven by collective efforts to find the best opportunities. A serious research programme to work out which causes and interventions have the most impact is relatively new, so we can expect more discoveries in the next few years. [^2] For more, see Paul’s essay on this topic. Note however that this research programme will also affect f via consideration 2, increasing the resources going to the area. We don’t have fantastic data on which effect is larger. Within global health over the past couple of years, better research has increased the resources going to top charities without much improvement in the recommendations, but it would be premature to conclude that this pattern is stable. This consideration supports a higher f.
The balance of these effects can be quite sensitive to your views about causes. If you mostly support a large cause like global health, then the effects of 1 and 2 are likely to be quite small, and 3 may give a positive f overall. If instead you want to focus on something which is currently small, like helping to grow and steer the effective altruism movement, then diminishing returns with future growth mean that f could be substantial and negative. This could easily be bigger than the edge available between the stock market and world growth rate, although we guess won’t normally be large enough to outweigh the personal returns from for example investing in your degree. 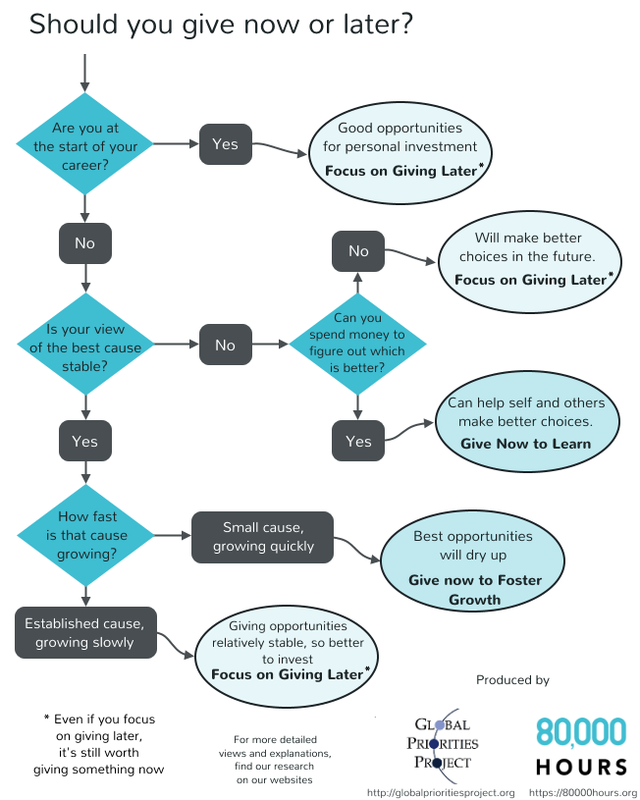 Making the now-versus-later comparison within a cause area is easier than addressing the question as a whole, but we should be aware that it skews the answer in favour of giving now. This is because we make the comparison between giving to X now and giving to X in a year, where X was selected to be the best cause to give to now. Properly we should compare between giving to X now and giving to Y in a year, where Y is selected as the best cause to give to in a year (perhaps currently unknown). The possibility that Y will not be the same as X gives extra reason to think f is higher. This covers both the possibility that you get a better view of the best cause with more time, and that the best cause in some objective sense actually changes. If you think either is likely to change quickly, this gives a major reason to invest rather than give now. What conclusions can we draw from this reasoning? The model and our views of the key parameters suggest focusing mainly on investing in high-return opportunities for self-improvement such as are often found near the start of your career. Later in your career, we think the model suggests that you devote resources towards impact now if you’re supporting a fast-growing cause, and instead invest them for later if you’re supporting an established cause or you have significant uncertainty about the best cause and think you will improve your judgement in the next few years. Of course, it’s always possible to stumble across an unusually good opportunity to either invest or give now, so there will be exceptions. We used this model to compare the effect of different interventions on long-term economic growth. What if we care about something else? It turns out that we can still use a similar analysis. The main place the focus on long-term growth entered this model was in understanding that the extra multiplier m produced by an intervention tells us the effect on long-term growth. In general let v denote the value produced by an intervention in some natural units; let V denote the v associated with the best intervention we know of, and let k denote the growth rate of V (analogous to f this could be positive or negative). Then we should prefer to invest our resources rather than giving today if k + r > 0. We get our earlier equation back as a special case, as if we care about long-run growth then k = f – g. The reason that g comes in that to compare interventions in different years, it’s not enough just to consider m: as well as the multiplier changing, forgoing a year of growth affects the long-run effect of an intervention. The factors which affect k will often be similar to the factors that affect f, so we think it is reasonable to draw similar conclusions: in mature areas it will often be better to invest, but with small growing areas it is usually better to give now, though this conclusion is less certain. Thanks to Sebastian Farquhar and Peter Orr for their comments and contributions. [^1]: If you work out the stream of benefits produced over time by the intervention discounted at the world growth-rate, and divide by a constant, you’ll essentially end up with m.
[^2]: The Copenhagen Consensus, the Gates Foundation, Abdul Latif Jameel Poverty Action Lab, GiveWell, The Future of Humanity Institute, and our parent organisation, CEA, were all founded on or after the year 2000. The Cochrane Collaboration (a major driver of the evidence-based movement in medicine) was founded in 1993. Of course, there has been lots of relevant academic inquiry produced for hundreds of years, especially in economics, but there seems to have been an acceleration in recent decades, especially from the perspective of actually applying the results to make real decisions. [^3]: According to “Expected Returns”, the long-run real return of world stockmarkets was 5.4%, with a range of 2.1 to 7.5%. p127 “Expected Returns”, by Antti Ilmanen (2011), Wiley Finance, which quotes a paper: Credit Suisse Global Investment Returns Yearbook 2010, Dimson, Marsh and Staunton (2010), Credit Suisse. [^6] Over the last century, average returns on capital have often been below average growth rates, but much capital is invested in lower return assets such as bonds and real estate. Piketty, Thomas. Capital in the Twenty-first Century. Harvard University Press, 2014. Posted in Position paper, Prioritisation research, Techniques.